Avoid keyword squatting Instagram influencers. There is no point bringing your authentic 'whole-self' to work if your whole self is an a**hole. There’s no longer a separation of the personal from the professional. Our online lives are not distinct from our day-to-day lives. Both ebb and flow into one fully-rounded self. The most fundamental virtues and principles in private and in public are in fact the same. Life is a whole and must be approached as such. 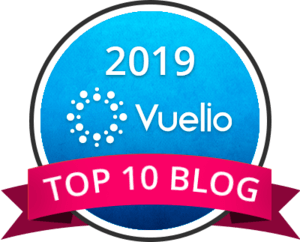 79% of respondents to an Influencer Intelligence’s and eConsultancy survey say they prefer influencer content over celebrity ads since it tends to offer a better reflection of real life. Influencer marketing evolved out of a growing appetite for authenticity among consumers. In real life, we make choices through our values, the language we use, the brands and causes we wish to be associated with, the way we behave, and the decisions we make. Each of us has a line across which we won’t cross when it comes to what we share to the social web. The social web has democratised the media. The power formerly seated within media mastheads has atomised to the individual. Today anyone who can consistently create compelling content can find and nurture an audience online. But just as creativity and publication have atomised to the individual so, too, has the onus to self-regulate, filter and ask before pressing ‘publish’: does this content pass the smell test? For decades celebrities have blurred their private and the public lives through the pages of Hello, OK!, Heat, and Closer magazines. The paparazzi fed our fascination to see more candid images of celebrities. Today the Instafamous pap themselves and choose to latch on to news themes and share life moments with their audiences - in return for paid sponsorship or self-promotion. 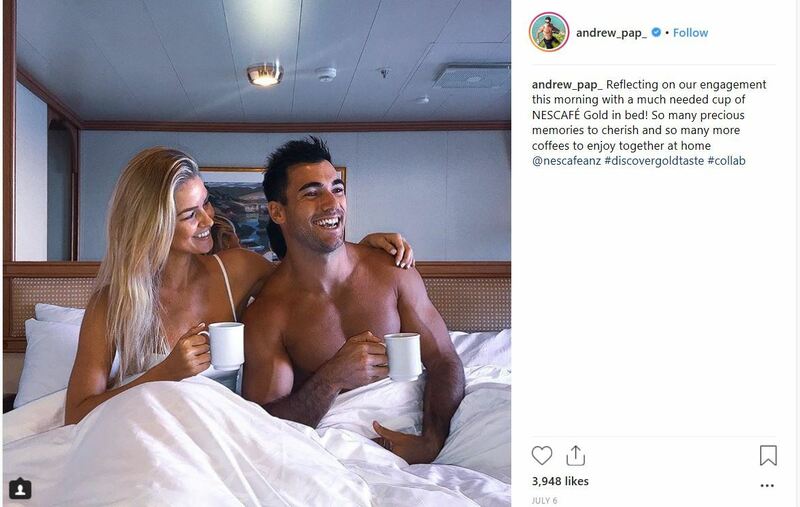 In July a former Miss Universe contestant and her fiancé were ridiculed on social media for using their engagement to promote Nescafe coffee. Ranae Ayris, a model and Miss Australia 2012 winner, announced on Instagram she had agreed to marry personal trainer Andrew Papadopoulos at the end of June. Their paid-for collaboration a few days later with the instant coffee giant sparked online derision and begged the question: why would anyone use such a ‘memorable life moment’ and tie it in with a sponsored coffee post? Papadopoulos captions the offending post: "Reflecting on our engagement this morning with a much needed cup of NESCAFÉ Gold in bed! So many precious memories to cherish and so many more coffees to enjoy together at home @nescafeanz #discovergoldtaste #collab". The facility to comment on the Instagram post has since been switched off. Ayris and Papadopoulos aren’t alone in cashing in on memorable moments. 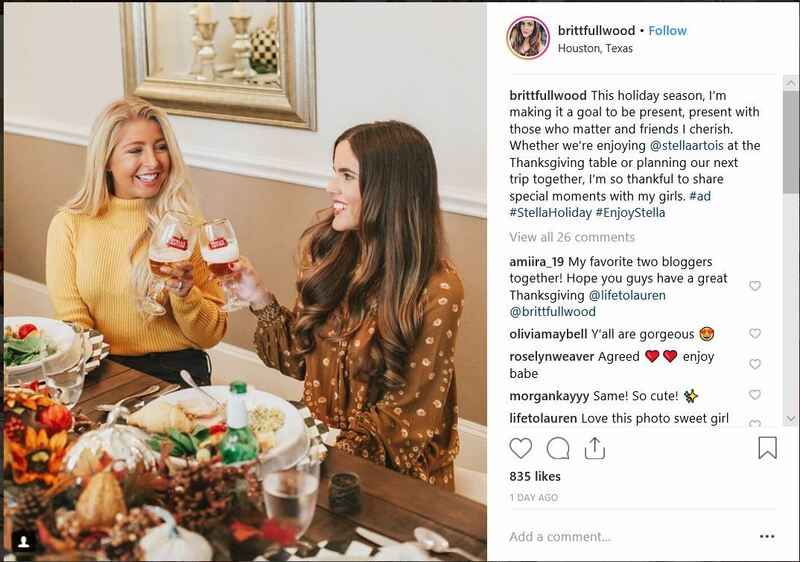 Brittany Fullwood aka Brittfullwood, a lifestyle blogger and Instagrammer, used Thanksgiving to promote Belgian beer brand Stella Artois in a paid-for Instagram collaboration. Fullwood told her audience: "This holiday season, I’m making it a goal to be present, present with those who matter and friends I cherish. Whether we’re enjoying @stellaartois at the Thanksgiving table or planning our next trip together, I’m so thankful to share special moments with my girls. #ad #StellaHoliday #EnjoyStella". What if you are seeking to capitalise upon something altogether more sinister as an influencer? Instead of trading memorable life moments for payment or high vanity metrics what if you seek to newsjack a natural disaster perhaps? Newsjacking is the process of injecting your brand into news stories, creating a twist that grabs eyes when they're open widest. Newsjacking is not new - the concept is as old as publicity itself, though the term is often attributed to David Meerman Scott. On Instagram, some influencers have highjacked hashtags related to California’s forest fires. Joan Donovan, a research project lead at Data and Society has termed this Instagram phenomenon: “keyword squatting” according to Buzzfeed. Explaining the phrase as, “using words related to a breaking news event, politician, or celebrity for personal gain”. The idea is to boost popularity on the back of something that’s happening in the moment. 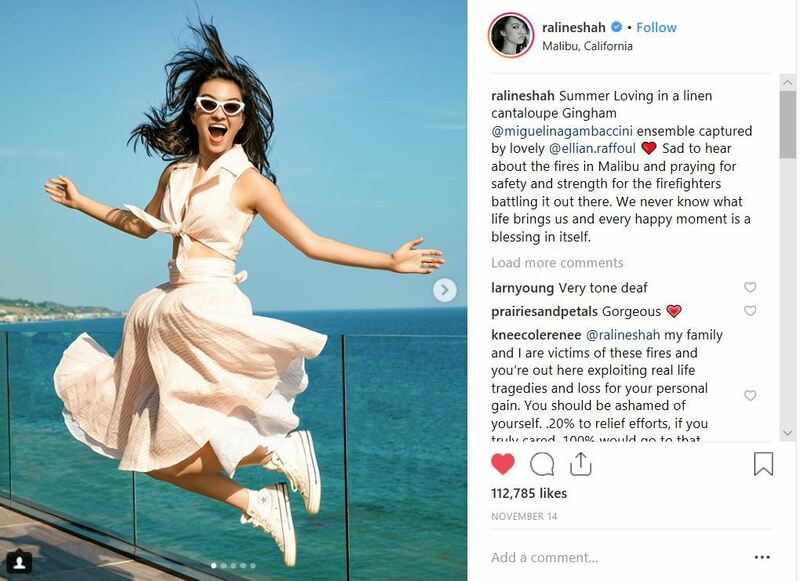 Last week actress Raline Shah aka ralineshah posted to her 5.6 million Instagram fans writing - in what appears to be a paid-for collaboration with fashion brand Miguelina: "Summer loving in a linen cantaloupe Gingham @miguelinagambaccini ensemble captured by lovely @ellian.raffoul Sad to hear about the fires in Malibu and praying for safety and strength for the firefighters battling it out there. We never know what life brings us and every happy moment is a blessing in itself." It's hard to separate any sincerity in the line about sadness for fires in Malibu when pitted against what appears to be a leap for joy in a summer dress. A paid-for leap for joy at that. To date the post has generated close to 113,000 likes. However, everyone has enjoyed Shah's sentiment. i_touchedthesky commented: "This post is totally NOT Fire related - over 80 people have died - my 76 year old elderly mom barely got out of Paradise alive & lost her house and this is a sickening promotion on the back of a true tragedy by using that hashtag. Wow, just WOW! How about 100% of the profits you’re making off of this be donated to the fire victims??!!!?? Honestly I don’t know what kind of person thinks this is ok??? It’s not & you should be ashamed." kneecolerenee wrote: "@ralineshah my family and I are victims of these fires and you’re out here exploiting real life tragedies and loss for your personal gain. You should be ashamed of yourself. .20% to relief efforts, if you truly cared, 100% would go to that. Lord have mercy on your soul." danyeldamasceno said: "unnecessary photo at such a sad time people losing their lives their homes and memories." fjzare commented: "Should be ashamed of yourself! Totally disgusting. Ugliness on the inside isn’t outweighed by prettiness on the outside!!!" 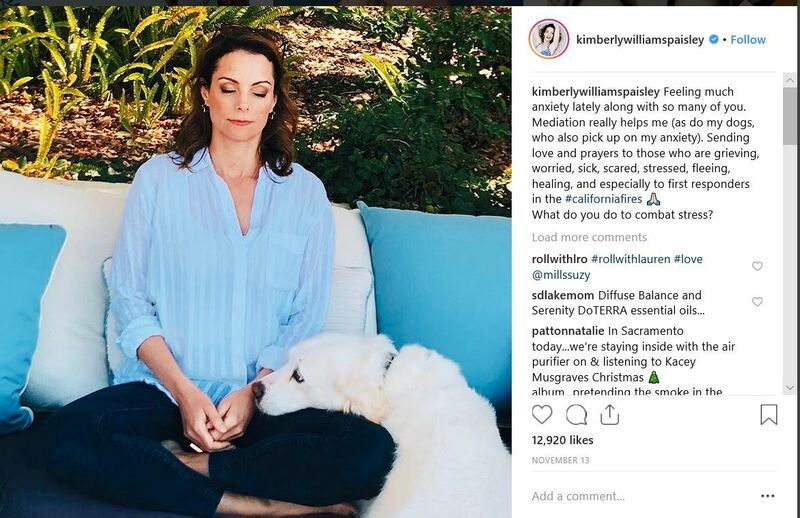 Other Instagrammers who have cashed in whilst the wildfires raged, include Jeremy Kost who uploaded a photo of himself standing naked on Malibu beach and Kimberly Williams-Paisley who told followers she was feeling 'much anxiety'. 90% of marketers say authenticity is critical to the future of influencer marketing according to the eConsultancy survey. More than two-thirds (68%) of industry respondents say that authenticity and transparency is key to influencer marketing success. But as change expert Dr Jen Frahm points out, "there is no point bringing your authentic 'whole-self' to work if your whole self is an a**hole." 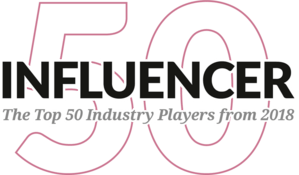 Influencer marketing is increasingly focused on ethics. But currently the discipline limits its interpretation of ethics to whether #ad was applied to a paid-for post. This is an important element, but only one element. When brands work with influencers they need to fully understand the whole fully-rounded self of that influencer. And better understand their values and priorities.